I had been in Berlin now for two and a half weeks, and I had become quite comfortable: Sleeping in every morning, browsing the internet, exploring during the day if the weather was nice, and meeting up with friends and couchsurfers almost every evening. Life was good. But I also knew that I had to move. That's the thing with traveling: You can't become too comfortable in one place, even if you're feeling tired and don't want to leave, because all the best experiences and all of the "magic" happens when you're moving. Well, I wasn't really leaving Berlin today for good: I had plans to go to the Highfield music festival the next weekend, and I would return to Berlin after that with Felix. In the meantime, however, I had 4 days to fill. So I decided to go to Dresden, a beautiful city that I was very keen to discover and where I knew a couple people. And given my past good experiences, I decided to hitchhike. 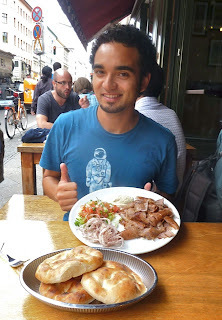 I started with a goodbye lunch with a new friend from Brazil that I met at Friday's couchsurfing meetup. We shared some amazing (albeit fancy) döner before I left for my hitchhiking spot. 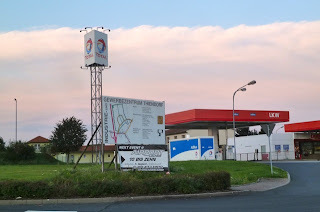 I researched (using digihitch and hitchbase) the best places to catch a ride out of Berlin, and I decided on catching a ride outside of a couple gas stations near Schöneweide. I took the S-Bahn there in the mid-afternoon, walked to the stations and asked everyone politely for a ride. I was politely declined each time. After about 20 minutes of this, I decided to make a sign and just thumb it by the road. The sign was not very effective. After another 15 minutes, one man pulled over and offered me a ride but he'd drop me off on the Autobahn itself, leaving me with no one there to ask for a ride. I considered that such a situation would be much worse than my current one, so I declined, and the man was also understanding. There were several people who looked very "hitchhiking-friendly," but when I asked for a ride, they were all either driving somewhere local, or going in another direction, or they simply had no space at all in their car. I stood by the side of the road, in a pretty good location, between two gas stations so that I could make eye contact with everyone pulling into either station or driving by. Most people ignored me or pantomimed "no sorry" as they saw me. A few minutes later, two girls arrived, and they were also trying to hitchhike to Dresden. The asked me how long I had been waiting, and I told them "about 45 minutes." They walked further down the road and tried to catch a ride from cars further down the street. It was about 1 hour into waiting there for a ride that I began to feel discouraged. But I knew I couldn't show it; I had to keep smiling and look friendly. So I did. The sun had shifted so that it was now directly in my face, making me look like a doofy beam of sunshine myself. But I kept at it, and, finally, one man nodded to me as he pulled into the gas station. 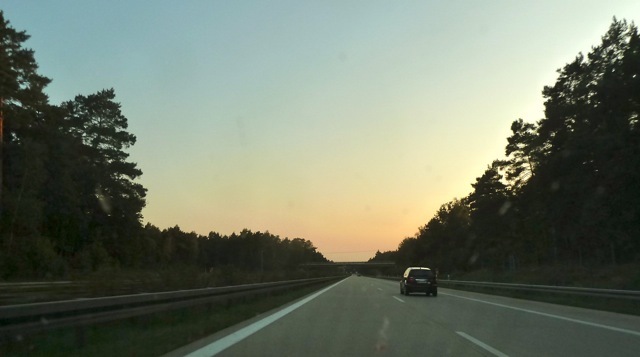 He was filling up his tank as I talked to him: He lived in a small town three-fourths of the way to Dresden, and he would drop me off at a rest stop along the autobahn. That's all I needed, so I quickly said yes and hopped in. His name was Jenz, and he drove a nice sedan. It's remarkable to me how people with such nice cars could be so open to picking up hitchhikers (it happened to me in the Netherlands only a few weeks before). But, as I'd learn, Jenz had grown up in the DDR (East Germany), where hitchhiking and sharing one's limited resources was very common. We chatted the whole way, in German, allowing me to improve my spoken German skills (although I end repeating many of the same stories and sentences, so it's in a sense more rote memorization than true language learning). I learned that Jenz worked in construction, and that he was just returning from a Baustelle in Berlin, and he'd have a project in Dresden the next few days. He was likewise very happy to hear about my experiences, as I told him about my big trip this summer and my ultimate goal of London. Jenz was gracious enough to drive me a few extra kilometers beyond his town, dropping me off at an exit with a McDonalds and a gas station. There, we parted ways and he even asked a couple people at the McDonalds to give me a continuing ride to Dresden. No responses, though, so we parted ways and I continued asking the McDonalds customers. The situation was tougher than in Berlin: There were only like 5 cars parked in the lot, and everyone I asked was either going toward Berlin (the wrong way for me) or was with a family and wouldn't want to risk having a stranger in their car. (Which is too bad, because I could tell that this one guy really wanted to give me a ride - he had the look in his face of wanting something exciting instead of caring for his toddler and his wife.) But alas, nothing. Evening was coming on; it was around 8pm and the sun was starting to set. I crossed the street to the gas station, but there was only 1 car there, and they were going to Berlin. 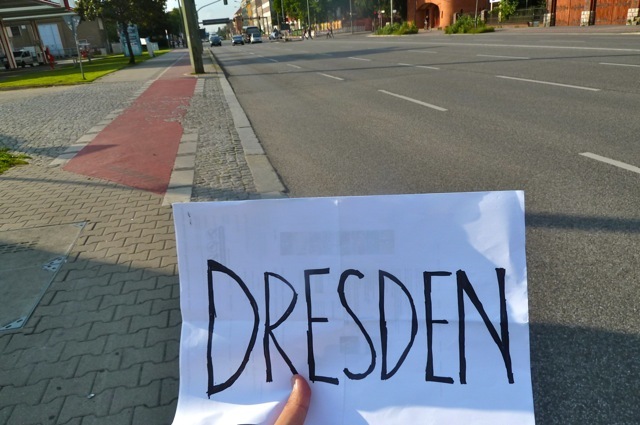 I walked to the Autobahn onramp and waved my sign "Dresden." Nothing. There was nowhere for cars to pull over, anyway. I returned to the gas station and waited, asking each car that came in. Nein, nein, nein. I asked the clerk inside if there was any easy way to bus to Dresden; she said that there was, but it was a school bus and the last one had left for the day. I was stranded in the small town of Thiendorf. Nighttime was coming on, and I was beginning to feel a little anxious. 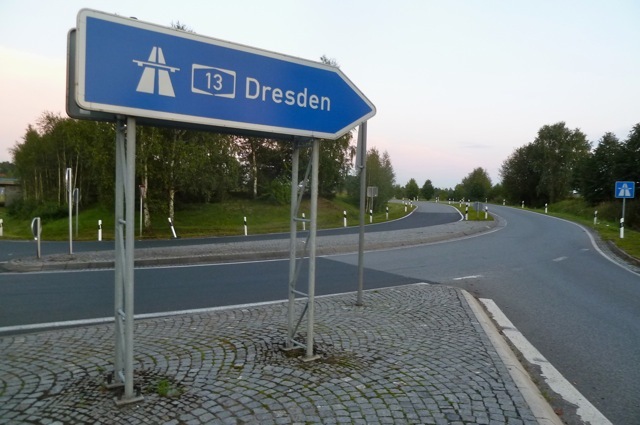 I knew that I was only a 30-minute drive to Dresden. Should I just start walking toward Dresden? I'd just keep asking people, since someone was pulling into the gas station every 5 minutes or so. And, well, luck was on my side. As I was standing at the gas station, a car pulled in. It was blasting some sort of German electro-hip-hop music, and there were three relatively young guys inside. I had a good feeling when I asked the guy filling up if they could bring me to Dresden. They briefly talked to each other and said "ja," and I hopped in. 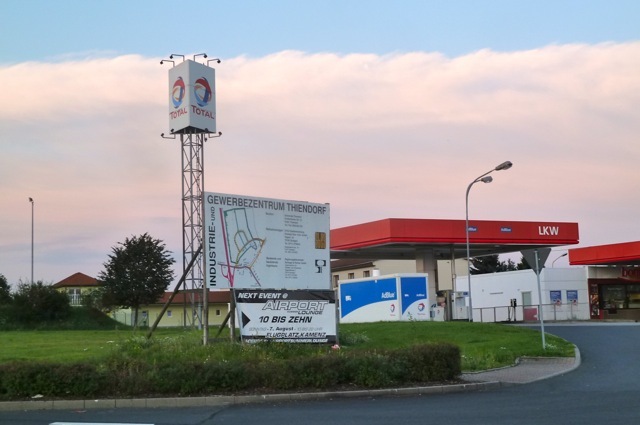 These guys actually lived in that tiny town of Thiendorf, and they were just on a short drive to the Czech Republic to buy cartons of cigarettes, because they're that much cheaper. Fascinating. They didn't really care too much about hearing my stories, which I didn't care too much about. Before I knew it, they dropped me off at the Dresden Neustadt Bahnhof, and I was only a short walk away from my home for the next few days. I made it, though it was really a close call. But there were several lessons from this experience: You gotta keep on moving, you gotta stay positive, and, as you may already know, don't stop believin'!